As this year has flown on by, we enter the final days before Christmas. The wonder, the joy, and the absolute childhood delight that is Santa, Christmas elves and twinkling lights. 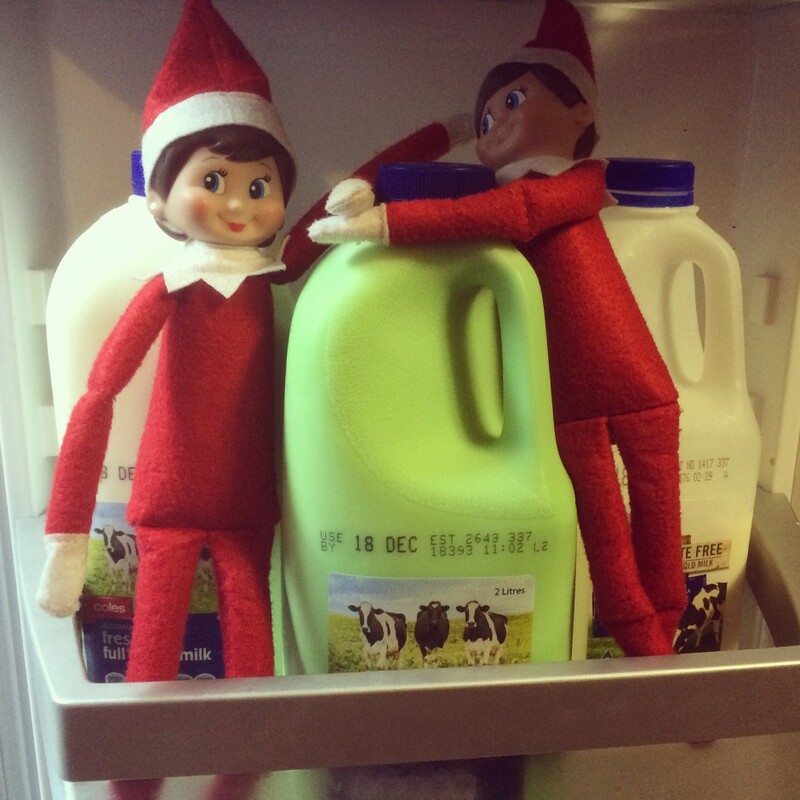 I see four faces captivated daily by the antics of our elf on a shelf elves – Charlie and Abby. I see four kids faces smile in pure joy looking at the Christmas tree and all the unique and ‘special’ decorations on the tree. Every year we all pick one decoration and buy it, then put in on the tree. We have some amazing decorations! “_________ That is not yours, it is _______, give it back to them”. I love the spirit of Christmas, mixed in liberally with the good old grinch, it makes trips to the shops a pleasure! Oh and then add in the hilarity of my kids who often just say what they think in earshot of the person/s (in true child form!). Things like ‘Mummy why are they so cranky?” or “Mummy, she is like you when you have not had your cuppa yet” (this one always makes me laugh). Then to the amazement they have at some of the window displays and decorations “Wow, Mummy, it is soooooo pretty”. I love watching their faces observe and then interpret situations. It is amazing watching them think; and hilarious listening to their theories and thoughts. For me, it is the safety aspect that sways me. Come January, the car park will be a ghost-town again in comparison! Every year I try to think about how we celebrate Christmas as a family – about how we can make our own traditions. Sometimes, I sit and think about what Christmas will be like in 20 years or 25 years when we will have partners, grand kids, and gosh knows what else coming to us. Will they still be begging for Mummy’s gingerbread? Or carrot cake? I hope so. Each year, each one of us selects one dish/food item for me to bake/make and we go from there. Each year one of us is usually working, this year, through I have know idea what luck, we are both off. I have the full 24 hours of Christmas day at home with my family (as pointed out to me by Hayden)! We will have Overnight French Toast for breakfast (which is as the name suggests, made the night before, and then popped into in the oven when we are going through the amazing part of present opening); roast turkey and vegetables for lunch, and ham and salad and leftovers for dinner. Oh and cake. There is always cake! I think part of our celebration as a family acknowledges the fact that sometimes Mummy or Daddy have to work; as people still get sick, people still need to go to the hospital. The kids ‘get’ that – and take a little bit of pride with it too. You can hear them talking to their friends sometimes about it and you can hear the pride in their voice. It is difficult having to try and juggle working shift work with kids at the best of times – but working Christmas is tough. I don’t mind working it – I just want to be home for the morning when we exchange gifts and see what Santa has left. That is all – as hard as it is to leave the kids when they are hopped up on Christmas Cheer, pretzels and gingerbread. Brings me to the lists. Hilarious, and surprisingly short. This was their ‘list’ to Santa. I asked Hayden why he only had two things on his and he said “Well Santa can bring me one of those, maybe both if I am lucky, and then I can ask you and Daddy for a DS”. Smart kid. The trio on the other hand, don’t really want much else. Sure they would like some ‘stuff from Smiggle please’ and ‘craft stuff’ but they are happy enough with their list. Which to me, is amazing. I was expecting long long lists of multiple items. This shows me though that they are growing up, and they are a little more aware that they can’t have everything. The past three Christmases have been so amazing. Christmas 2011 we had almost 18 month old triplets. We had a tree, on a table, behind child proof gates. They still picked off the decorations by climbing on top of each other, but we got away with minimal damage (to tree or triplet). Christmas 2012 we opted for no tree as the triplets were only 2 1/2 and took to trashing most things as a collective force – three v one, never a fair fight. So the tree kinda stood no chance. Instead, we had photos on the wall, in the shape of a tree. 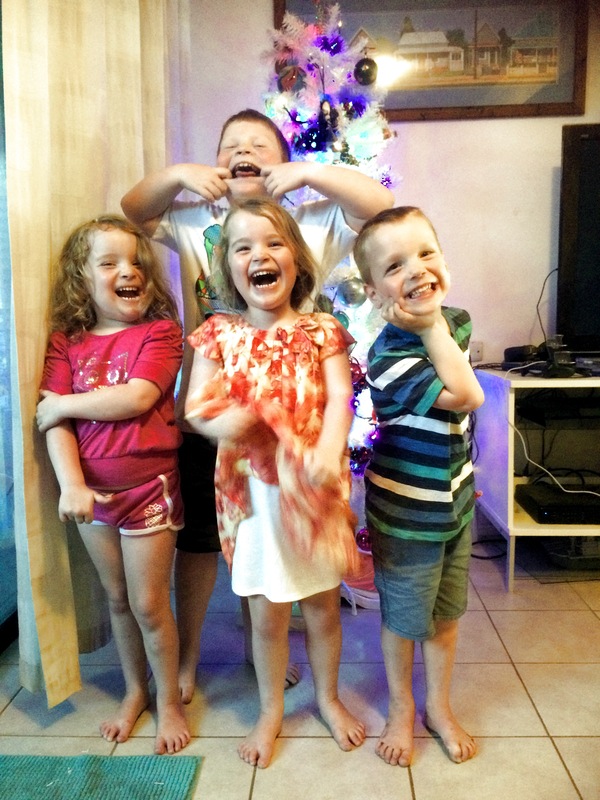 Last year we had a tree – and it was so much fun putting it up! We had 3 1/2 year old triplets and a 6 and 3/4 boy. It was exciting, magical and fun! This year, we have 4 1/2 year old triplets and a 7 3/4 boy. Each year it seems to get better. Each year there is more awareness, insight and of course individuality and personality. I love it! Brings me back to the lead up to Christmas. Each day, the kids rush down to see what our elves have been up too. Each day with more excitement than the last as it is another day closer to Christmas. The giggles and amazement at how our elves have dyed the milk with magical food colouring, or tried to make elf bread. It is gorgeous. And so infectious. It is just beautiful, although I think they laugh a little too much when the elves have been naughty! This is what I want for Christmas. This joy, this pure bliss. This carefree and unadulterated happiness; this belief that the world is a magical wonderland, and that we can all be kinder to each other. The singing of carols, the twinkling of lights, the handmade gifts and drawings. It is so incredibly precious. Each Christmas is not only a signal of the festive season, but of another year passing. Another year older. I don’t know how many more Christmases I will have with all the kids still believing. Believing in not only the good, but the magic; with joy and bliss as side effects. The sleepless night waiting for Santa to arrive (and falling asleep trying to stay up and catching him). The half eaten carrots, the cookies and milk, the letters to Santa, the elf on a shelf. It is all magical; and I hope it is the Christmas spirit that the kids are going to carry with them – and in their words – kindness, sharing and respect. I don’t think I can ask for more than that – it is priceless. Wish you and your wonderful family a merry Christmas en all the best for 2015 ! Hi Annemiek 🙂 Thank you so much for all your lovely comments! I love reading them and appreciate them! I hope you have a very merry Christmas and a fantastic new year! Lots of festive wishes mate -> From Australia!